In 1986, the Weekley and Parrish families took over and have since brought Davie Pro Rodeo to the grounds. Spectators watch the experts compete in riding and roping, from taking on a bucking bull to barrel racing and roping calves. In the mid ‘90s, Ron Bergeron, Sr. donated $450,000 to purchase land for a 1,000-car parking lot as well as landscaping and paving for the entrance of the arena. In his honor, the arena was renamed the Bergeron Rodeo Grounds. In 2011, the Davie Town Council passed a 99-year deed restriction to protect the arena. Born and raised in Davie, Weekley grew up with the rodeo with his parents, siblings and cousins, and today his own children, nephews and nieces participate. The first event of the year is the Orange Blossom Festival Rodeo in February, as well as the Davie Pro Rodeo in June and September. However, it all leads up to the biggest rodeo hosted at the venue, the Southeastern Circuit Finals in November, where cowboys and cowgirls from across the South vie for $150,000 in prize money. 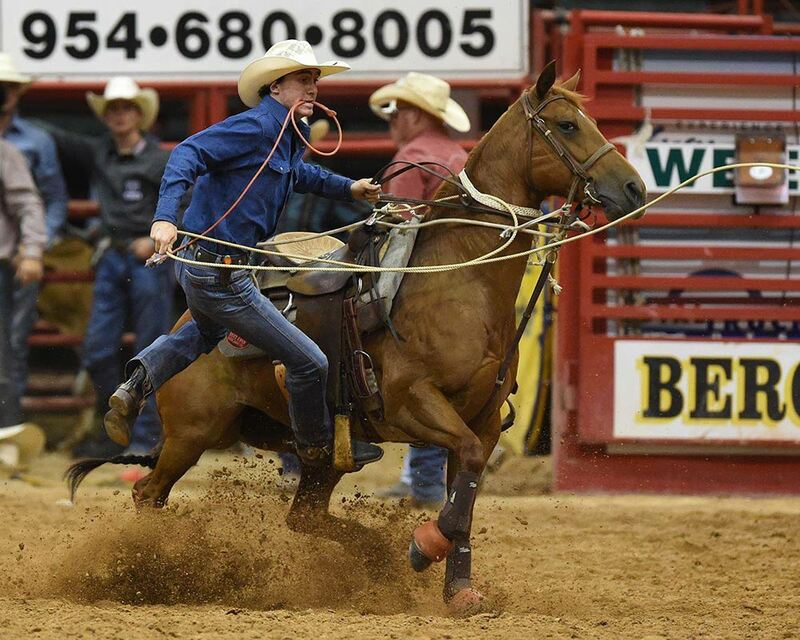 From there, they head north to Kissimmee — a town just outside of Orlando — for the RAM National Circuit Finals to compete for over $1 million. But it’s not just the big events that draw rodeo lovers. Every Wednesday, families flock to the arena for Jackpot Rodeo, a sort of mini rodeo where participants can strut their stuff, practice tricks, and get their animals acclimated to the lights and noise. Pioneers have called Davie — once upon a time known as Zona — home since the early 1900s, bringing their horses and cattle with them. The cowboy tradition is still alive in the town. Not only is western style found in some of the town’s architecture, but below the town’s welcome sign, drivers are asked to “be alert” for children, bicyclists, and — wait for it — horseback riders. Horse crossing signs are a regular part of the scenery and no one around here bats an eye when driving past someone getting to their destination by horse. While Florida as a whole is known for its postcard-perfect beaches, in reality, much of the state is home to cowboys and ranchers. There are roughly 18,000 ranches with more than 1 million head of cattle here. In fact, the Silver Spurs Rodeo, located just outside of Orlando, claims to be the largest rodeo east of the Mississippi. While traveling throughout the Southeast on the rodeo circuit, Weekley said people often are shocked to hear that South Florida has rodeos — besides Bergeron, there’s another one about an hour south, the Homestead Rodeo. The Bergeron Rodeo Grounds are located at 4271 Davie Road in Davie. Rodeos are hosted throughout the year, costing $8 to $10 for children and $20 to $22 for adults. Jackpot Rodeo is hosted every Wednesday and entry is $4.